Given enough time, most artists transition into the “McDonald’s” phase of their career. From baby boomer staples like The Rolling Stones and Jimmy Buffet to early aughts bands like Dave Matthews and Phish, many groups eventually just lean back and play the hits. New music manifests as soft retreads of tried and true ideas, and tickets and merch still fly out the door. It’s like McDonald’s: sales stay up for a familiar, consistent product, but it comes at the cost of excitement or surprise. Most of us either stay for the warmth of comfort food or we move on to something else. Even if you don’t count yourself as a Bruce Springsteen fan, Springsteen on Broadway is still a sight to behold. This feels counterintuitive because on the surface, it’s easy to lump Springsteen into the McDonald’s category. It’s been 35 years since The Boss was in his cultural heyday, dominating the charts and national conversation alike, but what’s always made him unique is his attempt to reflect the world as it is, not as it was in his prime. 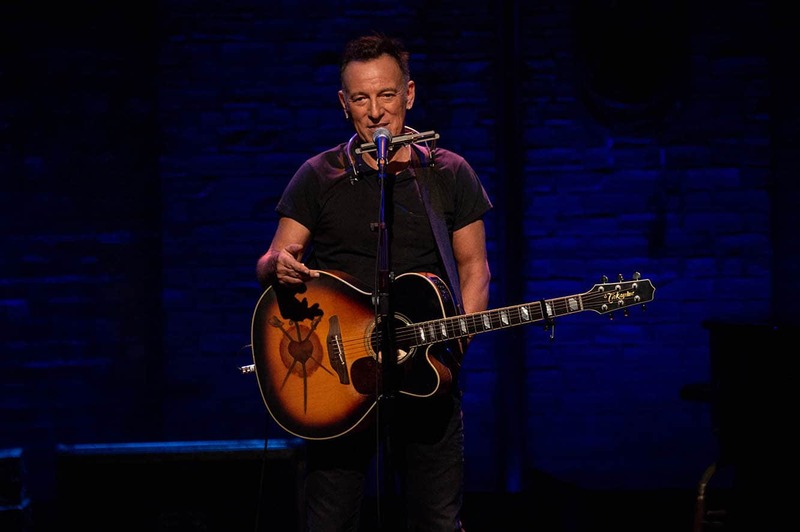 Springsteen began his residency for Springsteen On Broadway in October 2017, but after more than 200 shows, his final performance was captured on film for Netflix. In the show, the rock legend stands alone on an unadorned stage, his only tools a well-worn guitar and baby grand piano. For two and a half hours it’s just a man, some hit songs and the stories he has to tell. No breaks. No cutaways for interviews. No backing band. It wouldn’t be the most exciting premise save for the master craftsman and entertainer at the center, guiding the audience someplace both familiar and unsettling. It’s not accurate to call Springsteen on Broadway a concert film. Most of the time is filled with Springsteen’s stories, which he strings together like a novel. Through these interludes, Springsteen introduces us to the characters of his life, and some of the stories run as long as 15 minutes between guitar strums. At first, the tone is light and self-deprecating. Bruce recites the lyrics to his mega hit “Thunder Road,” packed with imagery of hitting the road and seeking adventure, only to reveal he currently lives 10 minutes from his hometown, and he wrote the song despite not knowing how to drive. He jokes about Catholic school, quitting guitar lessons and the universal awkwardness of puberty. The punchlines land hard and fast. Despite its heavy emphasis on grief, Springsteen on Broadway never falls into despondency. Rather, it displays a performer who’s reached the winter of his life handing down hard-won wisdom through chorus and verse. But along the way, something happened that shifted the Boss’ focus back toward faith. It’s a rare moment when the power of pop culture smacks into the eternal, the benediction of a prodigal son who cursed his maker, then found his way home several decades later. Whether Springsteen’s music has been a part of your life, On Broadway forces the viewer to stare down big questions surrounding grief, doubt and returning to faith. For good measure, it mixes in enough hit songs to keep the viewing experience from being a slog of sadness. It would be easy to dismiss On Broadway as simplistic nostalgia fare, but nothing could be further from the truth. Springsteen isn’t trying to force us to look back. Here, he’s set on turning our gaze away from the rearview mirror and toward both the good and painful parts of our current existence.